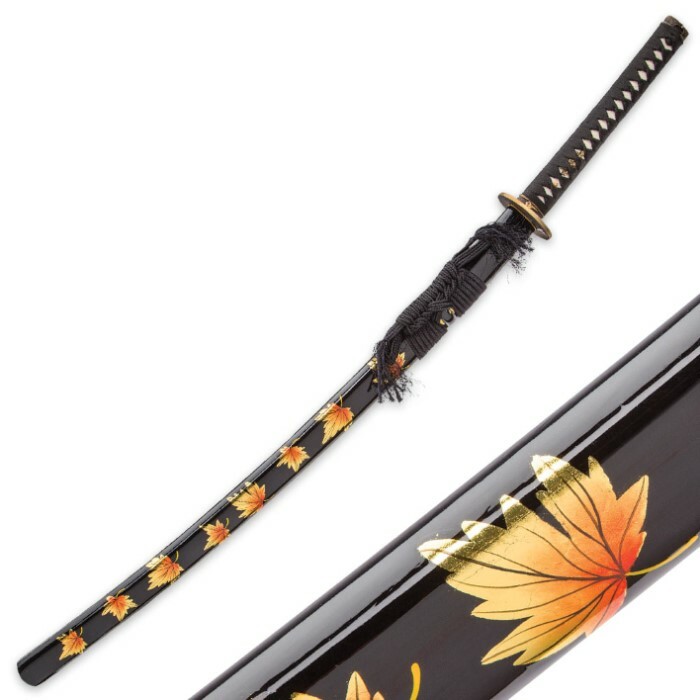 Not your ordinary katana - distinctive design, premium materials, time honored techniques all come together to form a true "legend of the fall"
Sokojikara's "AutumnSlash" Katana is a true legend of the fall...and the spring, summer and winter. And like leaves from a tree upon fall's first chill, foes drop to the ground - trembling - at the very sight of this potent sword. Friends and random onlookers may tremble, too, upon glimpsing the AutumnSlash, but in shear awe and admiration, rather; and perhaps even a bit of jealousy. There's no doubt - the AutumnSlash is a rare gem, teeming with vibrant color, distinctive visual allure and one-of-a-kind accents. 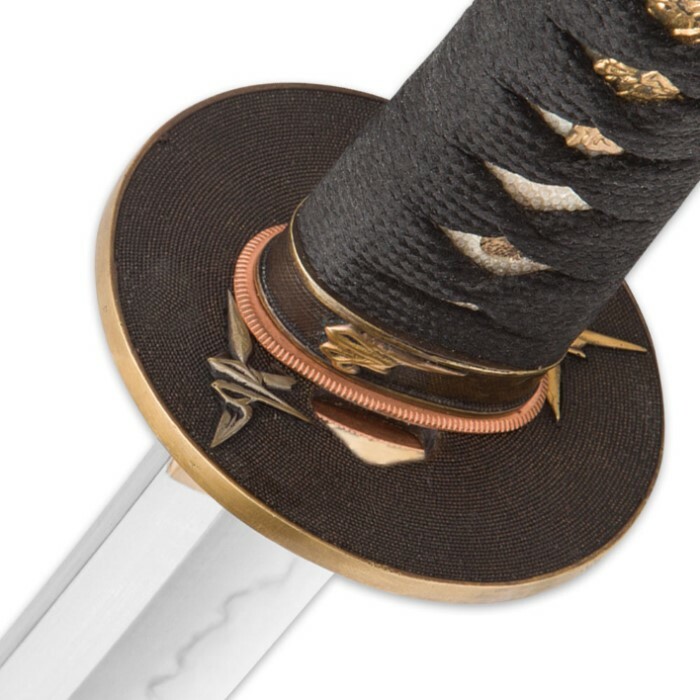 A literal masterpiece forged by a master's hand, it honors the past but is built to take on the unique rigors of the modern era - the pinnacle of ancient Japanese swordcraft in the 21st century. Adorned with brilliant crimson, amber and gold maple leaves, the stunning wooden saya is likely the first feature to capture your attention. And make no mistake - the saya is nothing short of exquisite, indeed, with its stately frayed sageo and hand-lacquered finish. But look more closely and you'll quickly discover many of the AutumnSlash's most breathtaking treasures are subtler, some even invisible to the naked eye and others altogether intangible. Not least of these is clay tempering – an integral part of what makes the AutumnSlash so special, yet its presence visible only via the delicate natural hamon line that ripples over the blade edge. Unique to traditional Japanese swordcraft, clay tempering is an ingenious differential steel hardening technique that yields the toughest, sharpest blades on the planet – even today, centuries after it was first developed by Edo-period smiths. Clay tempered blades also boast unrivaled edge retention, and the AutumnSlash’s impressive T10 high carbon steel blade is no exception. 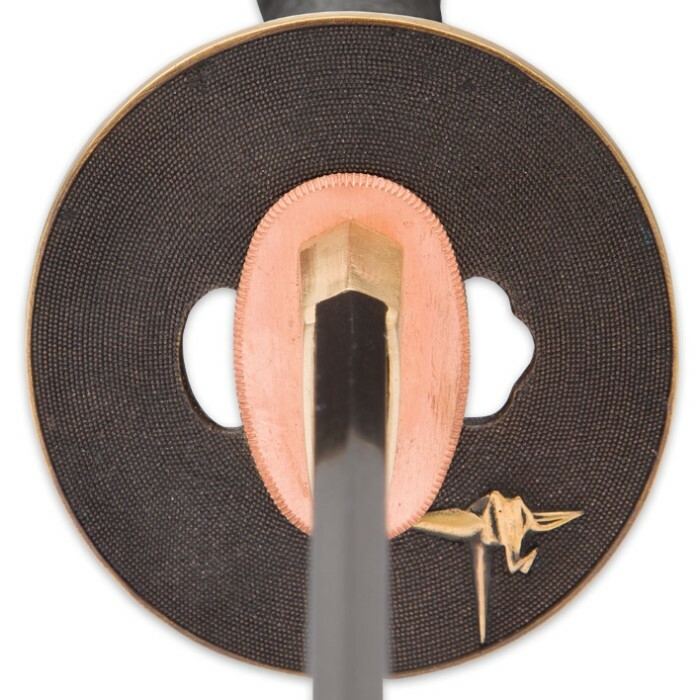 Prior to the intense heat of the hardening phase, Sokojikara's master swordsmiths coat the newly formed, unrefined blade with clay - a thin layer along the edge, thicker on the body and spine. When the blade emerges from the hardening forge, the contrasting clay layers cause the steel to cool at slightly different rates, yielding two distinct hardness regions. The edge cools faster and is harder for greater impact resistance, edge retention and strength. The body and spine cool more slowly, rendering it "tougher"- less brittle and better equipped to absorb impact energy. But action conveys fact far better than words. Experience the AutumnSlash's unbelievable cutting power for yourself; then you'll truly see clay tempering in action. The AutumnSlash can cut, cleave, hack, stab and - of course - "slash" its way through practically any material. Even cinder blocks prove no match for the potent tanto blade, as the T10 steel AutumnSlash blade glides through them effortlessly, like a koi through still water. It’s in punishing trials like this that clay tempering really demonstrates its worth. The blade suffers neither crack nor fissure, thanks to flexible, impact-absorbing spine, and the extra-hardened edge stays razor sharp. But you don't have to swing a punch just because you have the muscle. Likewise, despite its astounding strength and cutting capability, the AutumnSlash's spellbinding beauty makes it equally well suited to display – on a stand, in a collection or in the included wooden gift box. Indeed, the AutumnSlash is teeming with artistry and style, even beyond the breathtaking leaf-trimmed saya. Flawlessly cast from fine brass, the tsuba features an elegant weave-textured surface, bathed in a warm antiqued patina. A tastefully simple origami-crane relief offsets the darker, textured tsuba surface, as does the polished brass rim. The charming origami-crane motif is echoed on the brass fuchi and kashira. 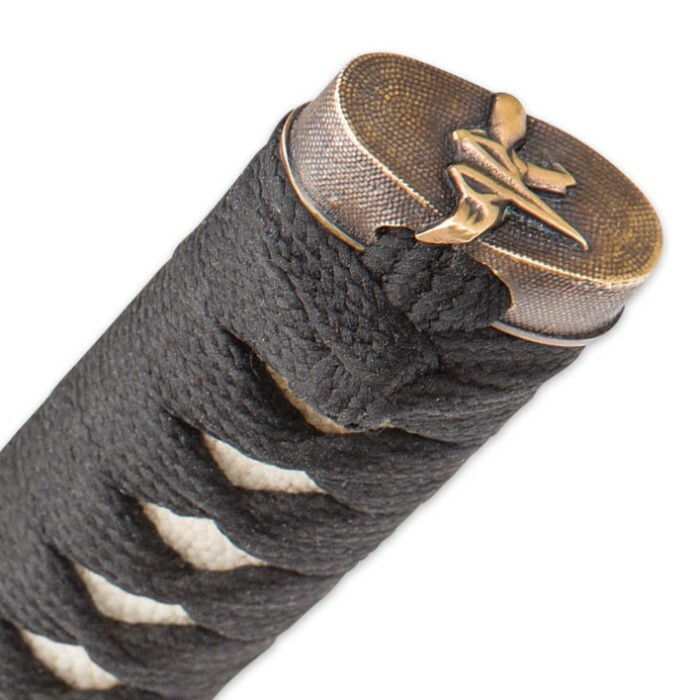 Wrapped in classic genuine ray skin same and traditional braided ito, the tsuka not only furthers the AutumnSlash's elegant-yet-clean look, it also provides an exceptional grip. 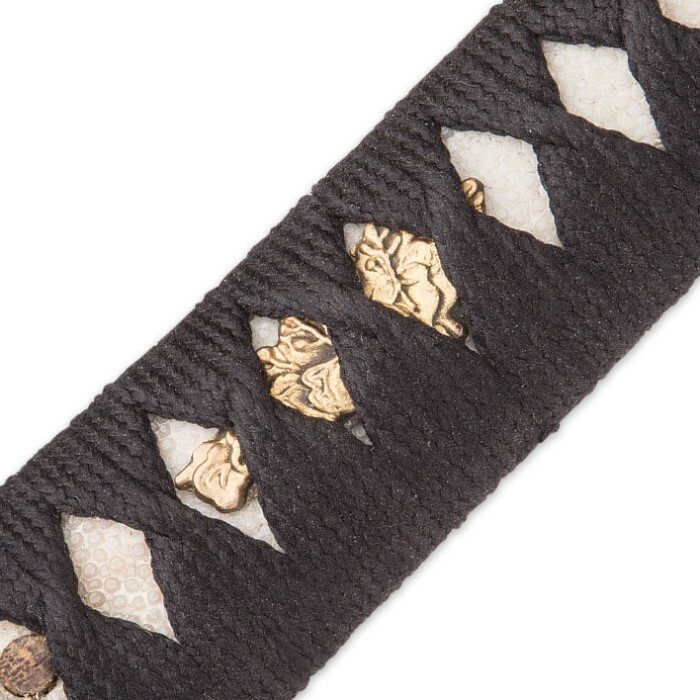 Old-school wooden mekugi and an ornate brass menuki are perfect finishing touches. Be intrigued. Be captivated. Then fall in love. "AutumnSlash your heart out!" Catch one glimpse at Sokojikara's AutumnSlash Katana, and you're intrigued, drawn in by its vibrant color and sleek form. Examine it a bit more closely, and you’re captivated. But when you grasp the AutumnSlash for the first time and make that inaugural cut - it's then you really fall in love. With proper care, generations of your descendants can fall in love with the AutumnSlash, as well. It makes a superb family heirloom! Like a tree-covered hillside at fall's climax, wielding the AutumnSlash is a thing of beauty, and photos could never fully do it justice. So experience it for yourself. 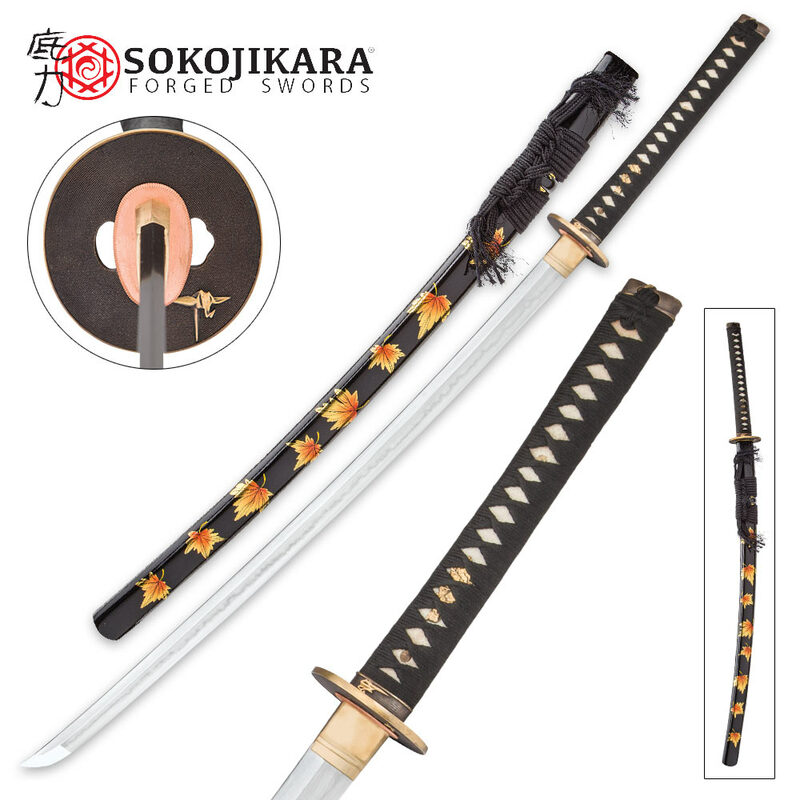 Fall in love with Sokojikara's AutumnSlash Katana - any season of the year.